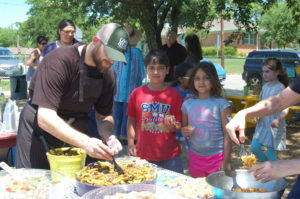 Students from Bayles Elementary and Armstrong Elementary along with their parents and volunteers from Southern Methodist University gathered in Bayles Promise of Peace (POP) garden Saturday afternoon to celebrate community and build bridges between the Clermont neighborhood and other Dallas communities. Many Armstrong and Bayles students are already pen pals and Saturday’s celebration “Hands Across the Garden” was an opportunity for students and their parents to get to know one another face-to-face. The Bayles POP garden was established in the spring of 2016. Founding Director Elizabeth Dry teaches nutrition, economical shopping and good food choices to students and their parents in the educational “Seed to Soul” program. 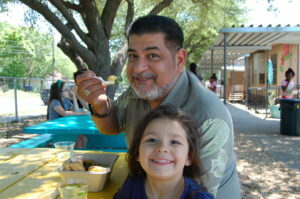 Bayles Elementary has more than 500 families who benefit from fresh produce grown in the garden as after school participation in the program allows students to harvest food from the garden for at-home preparation. “We are currently working on making a salad bar available in the school cafeteria with vegetables sourced from the garden,” Dry said. Changing lives one seed at a time, Dry began working with peace gardens eight years ago. “In addition to encouraging healthy eating habits, farming promotes high level thinking and problem solving,” she said. 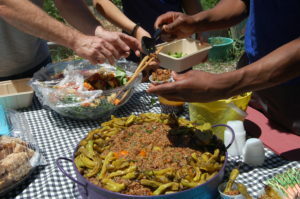 Believe it or not, Saturday afternoon’s celebration saw kids lined up to enjoy a picnic of foods like cucumber sandwiches, Crazy Carrot Coconut Couscous, Kung Poa Quinoa Salad with Kefir-Agave fermented Shishito Peppers and lavender infused lemonade. Chef Scott Syptak created the quinoa salad. Syptak comes to the garden with an impressive resume that includes studying at the famous Culinary Institute of America in New York and cooking at establishments like Hotel Za Za, Tillman’s Roadhouse and Chamberlain’s Steak and Chop House, but he will readily share that a few years ago he weighed more than 500 pounds. Not so today, and the chef attributes his successful weight loss to exercise and healthy eating habits. “I grew up in a household where chicken fried steak was plentiful! Don’t get me wrong, there is nothing wrong with chicken fried steak, but there needs to be a balance with fruits and vegetables,” Syptak said. “Today, I really enjoy cooking with Kefir and its probiotic benefits,” he said. Kefir is a cultured, creamy product with amazing health attributes. Kefir’s tart and refreshing flavor is similar to a drinking-style yogurt, but it contains beneficial yeast as well as friendly probiotic bacteria found in yogurt. The afternoon activities included a tour of the garden and the opportunity to choose and weave a weft in the bamboo Unity Loom. Ten-year-old Alexia Morgan was in search of her favorite color combinations to use in her creation. One of the day’s other highlights was the dedication of the newly planted apple tree to Bayles librarian Marci Peschke. POP is a non-profit organization seeking simple solutions for stagnate circumstances in urban communities. Their mission is to increase healthy lifestyles by education and contributing to a better tomorrow where neighbors help neighbors with wonderful fresh food and acts of kindness. Celebrations like Saturday’s “Hands Across the Garden” is keeping the promise. If you are interested in volunteering at Bayles garden or for POP, contact Elizabeth Dry at ejdry54@yahoo.com. Chef Scott Syptak and some of the POP children create a quinoa salad.